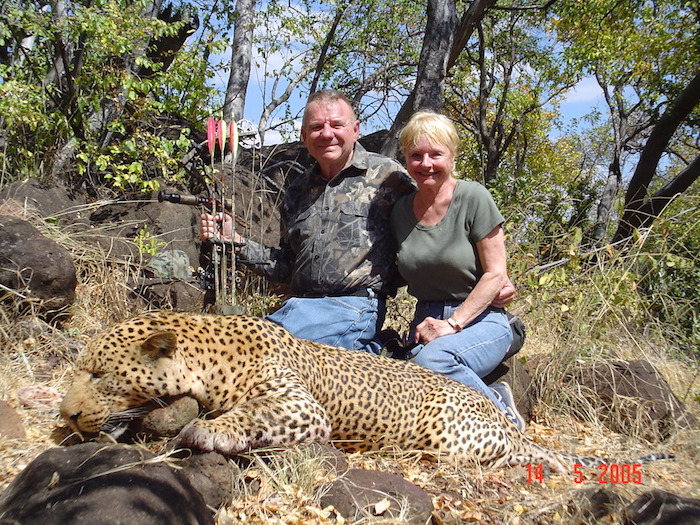 At Rosslyn Safaris, we offer a premium bow hunting experience for leopard and plains game. With over a dozen water points and plenty of opportunity for spot and stalk hunting, it really is the place to be! Our purpose built bow hunting blinds consist of ground or pit blinds and tree blinds with enough room for 3 – 4 adults to sit comfortably. 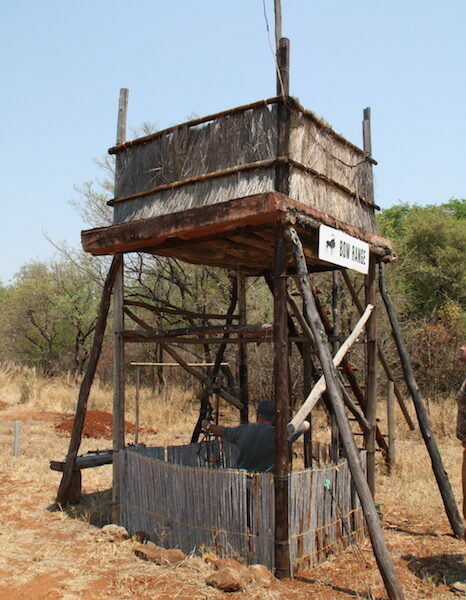 The pit blinds have a raised podium to sit on and space in front for the hunter to stand up and use his bow, with hooks provided to hang your bow. All waterholes and blinds are designed such that average shot is 25 yards or less, which also means you can take fantastic photo shots of the animals up close! 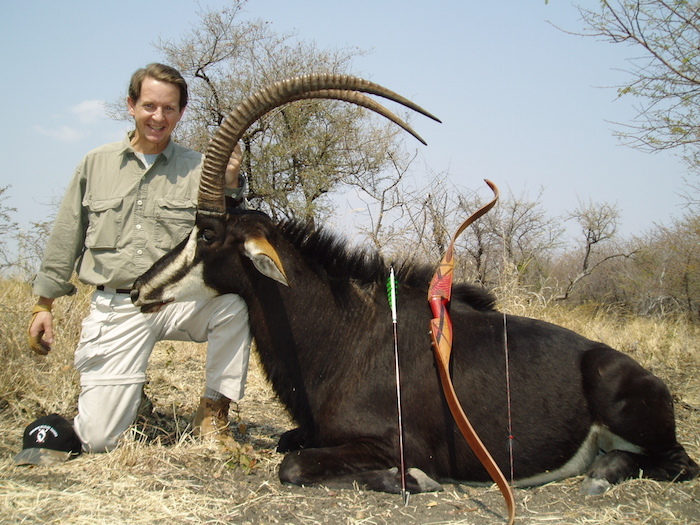 Bow hunters usually spend the early morning and late evening stalking for specific animals. 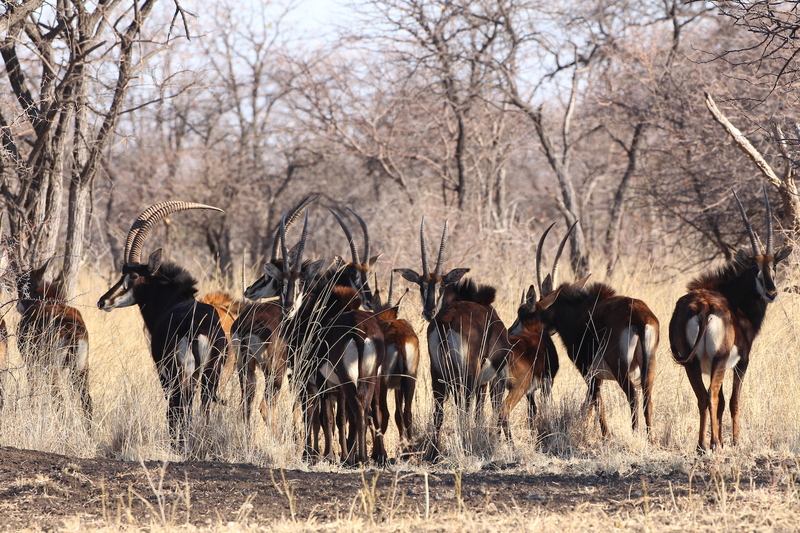 Then, during the heat of the day, when many animals come to drink is when bow hunters stake out the waterholes. You’ll enjoy a full picnic lunch while in the blind and plenty of snacks and drinks during the day. 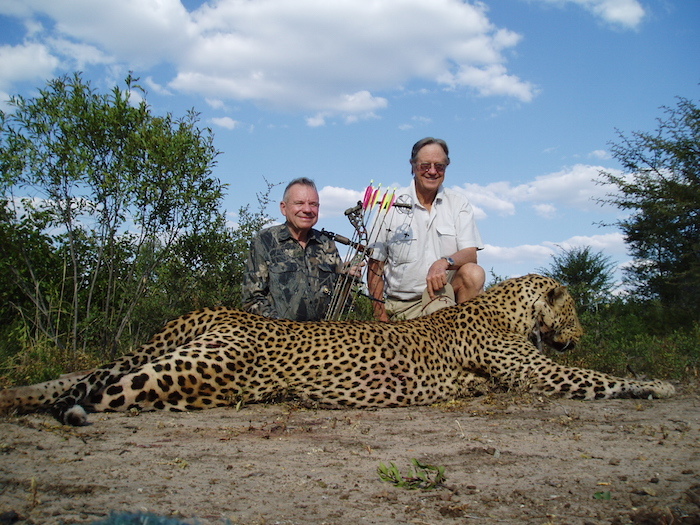 Bow hunters after a leopard will most likely hunt from a pop up blind or natural brush blind very close to the bait – so practice being ultra-quiet while standing to use your bow! Remember, cotton or woolen clothing is the quietest. If you or a friend can hear your clothes when you move, find something else to wear! When hunting leopard you’ll spend the early hours of the day checking baits and making plans for the next hunting step. During the heat of the day you’ll go to a waterhole to hunt some plains game before heading out for an early arrival at your leopard blind. For bow hunting, the besttime of year is in our winter going into spring and summer (June through to early November). Look at the phases of the moon when planning your trip. Plains game tend to be less active at the waterhole during the main part of the day during the full moon period, while a full moon might help if you’re hunting leopard! We’re happy to help you perfect your timing, so don’t be afraid to ask when booking your hunt. If you’re going on a non-hunting holiday before or after your hunt, lugging bows around with you can be a chore. We also have bows for hire, just ask us about them when booking. 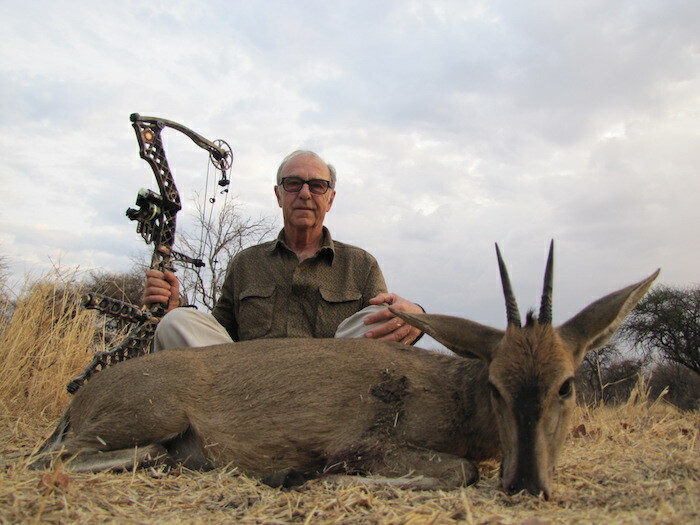 In Zimbabwe you can use a compound bow, a recurve bow, or a long bow. A minimum draw weight of 50lbs is required for plains game hunting (however a bow of 60lbs plus is recommended, whatever you’d normally use to hunt whitetail deer is fine for most plains game). Arrow-heads should be 3 or 4 blade and fixed. For plains game, a standard arrow weight is sufficient. 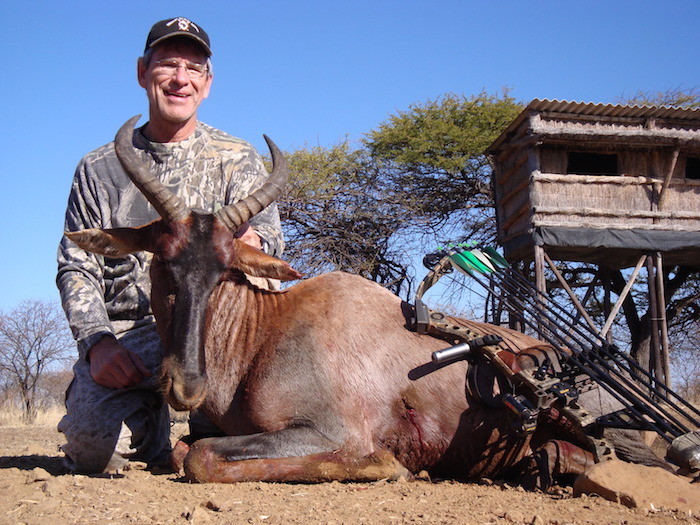 For an eland, a heavier arrow of 400 – 500 grains. 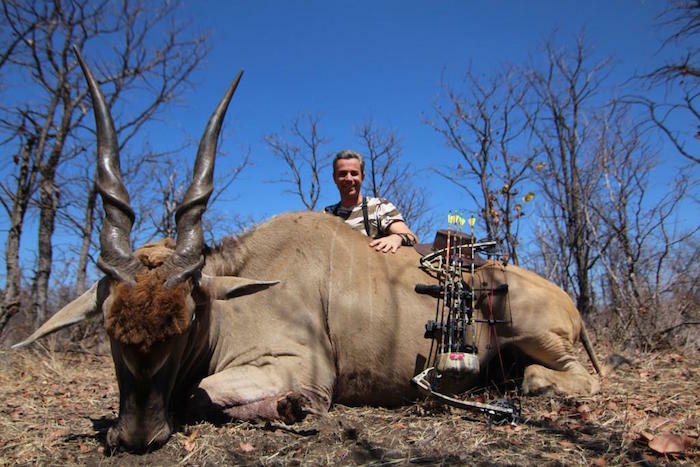 For giraffe, buffalo, hippo or crocodile hunting, you should be pulling a minimum of 80lb and your arrow must be in the 750 – 900 grain class. For elephant you should aim to pull higher and have heavier arrows. It is strongly advisable to buy an African animal shot placement book (safaripress.com) and study the diagrams.